The current research addresses Engineered Cementitious Composites (ECC) as a new alternative for retrofitting damaged concrete beams. Twenty-one plain concrete beams with pre-defined artificial cracks were prepared and repaired using different combinations of ECC alone or together with Carbon Fiber Reinforced Polymers (CFRP). The study showed that replacement of the inferior layer from the bottom of the deteriorated beams with a thin layer of ECC could be able to restore the beam to a condition better than its original state. Moreover, the repair with ECC was found effective in enhancing the member ductility as well. It was also shown that pasting CFRP directly over ECC substrate resulted in shear failure rather than the undesirable interfacial debonding mode of failure that typically occurs in case of concrete substrates. A.M. Anwar, K. Hattori, H. Ogata, M. Ashraf and Mandula , 2009. Engineered Cementitious Composites for Repair of Initially Cracked Concrete Beams. Asian Journal of Applied Sciences, 2: 223-231. Deterioration of concrete structures can appear in the form of extra deformations and cracking of the structure elements at the most stressed portions. Repair of concrete structures requires sufficient experience to the various ranges of the repairing materials with their different physical and chemical properties as well as the optimum method for their application. Compatibility with the original construction material, the ease of use in a wide variety of situations, simplicity, speed of application and the total cost are all crucial in selecting the appropriate repairing material. Many researches have studied the repair and retrofitting of concrete members containing cracks. Waleed et al. (2005) used cement grout, epoxy injection, ferrocement layer, carbon fibre strip and section enlargement to repair cracked concrete slabs. The introduction of a high performance fiber reinforced cementitious composites called Engineered Cementitious Composites (ECC) by Li (2002), nearly two decades ago, attracted many researchers to utilize this material for repairing and strengthening purposes. ECC has strain hardening behavior when exposing to tensile forces. It also exhibits a strain level two orders of magnitude higher than that of concrete (Maalej and Leong, 2005a, b). The many cracks with very small crack width are considered one of its superior characteristics. The fibers inserted in ECC help in bridging the applied forces through the generated cracks. Cost wise, ECC is very expensive to be used on a big scale and should only be applied at particular places of the damaged structures. Li et al. (1995) and Lim and Li (1997) overlaid the concrete substrate by layers of ECC, It was shown that the delamination and spalling modes did not occur; micro size cracks were found instead. Kamada and Li (2000) found that smooth surface preparation of the substrate concrete achieved good structure performance than the corresponding cases with rough surface. Zhang et al. (2006) conducted theoretical and experimental studies to check the suitability of using ECC as a strengthening material for beams, the results showed enhancement in the flexure behavior of the beams with increasing ECC thickness. On the other hand, Maalej and Leong (2005a) conducted a primary study to strengthen reinforced concrete beams, containing ECC layer located at its base, with CFRP. However, the study was preliminary and required further investigations. In the current research, plain concrete beams were prepared and tested destructively. Each specimen contained artificial crack with a depth equal to 50% of the beam thickness. ECC with different thicknesses was used as a repair material alone or simultaneously with Carbon Fiber Reinforced Polymers (CFRP). Different curing ages were deliberately selected for both the substrate concrete and the repairing material, ECC. It was thought that this combination might be close to reality. Moreover, the effect of ECC stiffness to the original beam stiffness was also tested. The results showed enhancement in the section capacity as well as the ductility of the repaired beams. Twenty-one scaled down plain concrete beams with dimensions (depthxwidthxlength) equal to (100x100x400 mm) were prepared. Small size beams were selected to minimize the cost of the used ECC. The specimens contained artificial cracks, 50 mm depth and 2 mm width, located at their mid-spans. The cracked beams were designed so that their load carrying capacity should not exceed 20% of the sound specimens. The above condition was confirmed by conducting many side experimental tests. The cracks were conducted by placing separators in the moulds before casting the concrete. 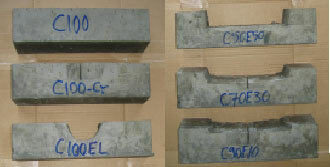 The combined concrete/ECC beams were prepared through two stages; first, the concrete was cast leaving a free space in the moulds as shown in Fig. 1, second, after 28 days of water curing to the concrete, ECC with different thicknesses was added to fill the remaining free spaces in the moulds. ECC was placed locally around the crack, or with thicknesses of 10, 30 and 50 mm from beam bottom. For more details about the notation of specimens as well as the number of replications for each case, refer to Table 1. After casting ECC, the final repaired specimens were again kept for curing in water for another 28 days. The specimens were mainly divided into seven groups. 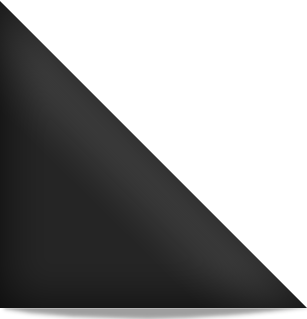 Group 1A, represented the original state of the beams before deterioration and was kept as a target condition to all the deteriorated specimens. Group 2A, represented the deteriorated severe cracked case with no repair. The current research aimed to retrofit the beams from condition similar to group 2A to reach its original state (i.e., group 1A). The other five groups represented beams with different repair combinations. To distinguish the groups, either a letter A or B was added to the group number. The letter A means that the conducted repair method was by using ECC only. The letter B denotes groups where CFRP sheets were applied simultaneously with ECC. The specimens were subjected to four points loading bending test with a bending span of 300 mm. Load deflection curves were measured at the mid spans of beams. In the current study, the repair length of ECC was 280 mm, i.e., 20 mm lesser than the bending span. The difference in age of both concrete and ECC might also coincide with real conditions. It was thought that these configurations could help in studying the spalling of ECC from concrete substrate, if any and could end-up with a better understanding of the flexure performance of the repaired beams. The mix proportion for both the concrete and the ECC are shown in Table 2 and 3, respectively. The concrete mix was designed as per the American Concrete Institute, ACI 211.1-32. The used ECC was in the form of ready mixed powder. ECC incorporated high modulus polyethylene fibers. The fiber length is 12.7 mm and diameter 38 micron, tensile strength of 1690 MPa and an elastic modulus of 40,600 MPa. An expansive agent and an alcohol-type shrinkage reducing agent were added. A bio-saccharide type viscous agent was also applied to provide compatibility between fluidity and fiber dispersibility. In addition, a polycarboxylic-acid-based superplasticizer was simultaneously used. The ECC mixture was brought from Kajima Technical Research Institute. More details about the used ECC were reported by Kanda et al. (2006). The measured compressive and flexural strengths of concrete after 28 days were 35 and 4 MPa, respectively. The corresponding values for ECC were 27 and 9 MPa, respectively. At the test day, a little deviation was noted on the concrete and the new values at 56 days were 36 and 4.5 MPa, respectively. In case of applying CFRP, the required surfaces were polished and smoothened; primer coat followed by a two compound epoxy risen were applied. The detailed application procedure for the unidirectional CFRP was noted by Anwar et al. (2007). CFRP was applied at the beam soffit leaving a 5 mm spacing between the cut-off and the support from both sides. Table 4 and 5 show the physical properties of the used CFRP and epoxy, respectively. The load-mid-span deflection curves for the conventionally used methods are shown in Fig. 2. The current repairing methods are shown in Fig. 3 and 4. Noticed enhancement in the section capacity was observed. Specimen repaired only with traditional epoxy injection (C100-cr-epoxy) showed a 130% enhancement in the section capacity over the cracked specimen (C100-cr). It, however, failed to reach the section capacity of the beam original state (C100). It was also noted that the traditionally used repair technique (C100-cr/CFRP) exhibited a section capacity 133% higher than the target beam (C100). In the current research, the repair with ECC alone was found more effective. Both the loading capacity and the ductility of the repaired beams were enhanced. For (C100-El), ECC was only applied locally, around 100 mm at the beam base and extended to the full crack depth. The enhancement in the section capacity was 220% more than the damaged state (C100-cr). Although this combination was still not able to reach the initial original state of the beam; it was found better than the traditional case (C100-cr/epoxy). The low loading capacity might be attributed to the relatively small contact area between ECC and the base concrete at a zone of extremely high normal stresses. The application of ECC layers, with different thicknesses with a longer distance among the beam soffit, improved the flexure performance a lot. It was observed that ECC acted as a bridge to convey the internal forces between both sides of the crack. Retrofitting of the damaged beams with ECC showed that the original integrity was not only restored but enhanced as well. The section capacity for (C90E10), (C70E30) and (C50E50) was found 12, 42 and 75%, respectively, more than the target specimen (C100) and 505, 640 and 790% higher than the damaged specimen (C100-cr). Generally, the increase in ECC thickness led to the increase in the section load carrying capacity. The same combinations were again repeated after applying CFRP sheets at the beam soffit. The results showed that the mitigation in the section capacity for (C100El/CFRP), (C90E10/CFRP), (C70E30/CFRP) and (C50E50/CFRP) over the target beam (C100) were 127, 153, 115 and 119%, respectively. The previous values did not show substantial variation and a little bit lesser than that of (C100-cr/CFRP) except for the case where ECC was of minimum thickness. The application of CFRP led to an increase of the absorbed energy by the beam until failure. This energy was in the form of high loading capacity accomplished with small deflection. That was the reason for having small variation in the load carrying capacity for all the specimens incorporated CFRP. Table 6 shows the flexure test results for all the examined specimens. Moreover, it was noted that 30-50% reduction in the effective shear resisting cross-section for both (C70E30/CFRP) and (C50E50/CFRP), respectively, was behind the observed pure shear failure and the reduction in the total load carrying capacity. For instance, it can be suggested that the use of ECC with CFRP did not influence the section loading capacity compared with cases with no ECC. ECC was found significant to act as a transient material between concrete of low strain capacity and CFRP of relatively high stain capacity. ECC was also able to change the mode of failure of the beams. In general, the mode of failure changes by changing the repair method. Figure 5 shows the modes of failure for the examined specimens. It was observed that both the control (C100-cr) and target (C100) specimens exhibited pure flexure mode of failure. For the commonly used repair method, (C100-cr-epoxy), flexure failure had also occurred; the crack started exactly from the same place of the pre-existing fault after peeling of the epoxy from one of the crack sides. For (C100-El), flexure crack with spalling of the local ECC was noticed. This revealed that the contact between the concrete layer and the ECC was not capable of withstanding the induced tensile stresses. For (C90E10) and (C70E30), flexure mode of failure started exactly at the crack position and continued through the whole ECC thickness. It was noted that the contact length was sufficient and spalling of the ECC layer was not observed. The effect of the repairing material stiffness was significantly noticed when ECC thickness reached 50 mm. For (C50E50), the failure of one of the specimens was observed early after debonding and spalling of the ECC layer, nearly at a position just under the applied load point. The relatively high rigidity of the ECC layer prevented the ECC from following the same deformation of the concrete beam, thus spalling occurred. The second specimen failed almost by the same mode but the separation was only limited to one side surface of the ECC layer, the crack started at one side of ECC and followed vertically causing separation of ECC from concrete; the crack was then preceded directly to the support. It was shown that in the repairing process, the thickness along with the length of the applied ECC should be precisely selected and more investigations are still required. After applying CFRP sheets at the beam soffit, the mode of failure was changed. It was however noted by many researchers that applying CFRP sheets directly to concrete surface could end up with undesirable interfacial debonding mode of failure. The concentration of the interfacial shear stresses near the vicinity of the crack was the main cause of the delamination of the CFRP sheet (Maalej and Leong, 2005b). For (C100-cr/CFRP), flexural crack induced interfacial debonding mode of failure was observed, the debonding location started just underneath the load position, this fact was also noted by Aprile et al. (2001). For (C100-El/CFRP), flexure shear crack followed by interfacial debonding of CFRP was observed. 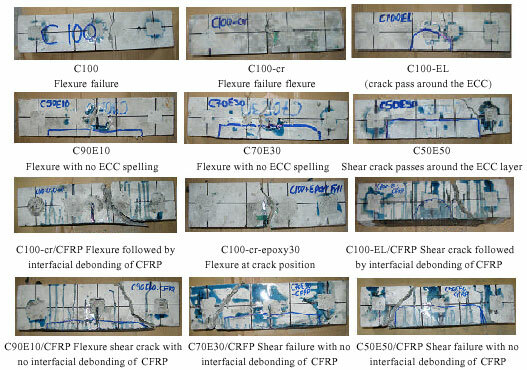 In contrast with concrete, for all the other specimens where CFRP was applied over the ECC layer with different thicknesses, the common interfacial debonding of CFRP was changed to shear failure. Flexure shear crack was observed in case of (C90E10/CFRP) while (C70E30/CFRP) and (C50E50/CFRP) underwent a pure shear mode of failure and the crack was found extending from the support directly to the nearest loading point. The shear crack split the concrete near the support leaving a small portion attached to the ECC layer. This emphasizes the great influence of ECC on delaying the interfacial debonding failure or even avoiding its occurrence. It was thought that if the beams were well confined in shear, the previous trends might have little changes. Moreover, it might be expected that the interfacial debonding would have happened but after achieving higher loading value. The reasons for the strong bonding between ECC and CFRP might be attributed to the ability of ECC to develop very high strain comparing to concrete; along with the small size cracks that were created in case of ECC. The previous reasons might lead to minimize the induced shear stress in the adhesive layer and decelerated the debonding failure. Moreover, the presence of large amount of fibers on the prepared surface and just underneath this surface created also strong bonding between CFRP and the ECC substrate; it effectively helped in resisting both the induced shear and normal stresses generated along the intermediate adhesive. Finally, it can be concluded that the dissipation of the consumed energy during loading for system repaired with CFRP might follow either, (i) developing of a localized crack at the, most stressed, bottom surface followed by the debonding failure mode when pasting the CFRP directly over concrete surface or (ii) developing of another crack failure mode - here it was shear crack - rather that the interfacial debonding failure mode when pasting CFRP directly on ECC. Ductility is the ability of the repaired beams to carry deformation under peak load without full collapse. Figure 3 shows also the enhancement in the member ductility with the increase of ECC thickness. The maximum deflection was also noted and shown in Table 6. It was clear that the undergone deflection was directly proportional to the ECC thickness. The application of CFRP showed only minor changes in the maximum deflection achieved by the specimens. The decrease in the maximum deflection of (C70E30/CFRP) and (C50E50/CFRP) was due to the occurrence of shear failure that prevented the beams from reaching their ultimate deflection limits. It was however suggested to carry out similar combinations again after confining the high shear stress zones so that the comparison would be more realistic. ECC had the ability to bridge the internal forces between the crack sides due to its high ductility and perfect contact with the substrate concrete without the use of any adhesives. Local placing of ECC at the crack position had no great significance in restoring the integrity of the damaged structures. As the thickness of ECC increased, both the section capacity and the ductility of the damaged beam were enhanced. The repair incorporating CFRP sheets showed almost similar flexure strength achievements. However, when ECC was used as a substrate to the CFRP, the mode of failure was changed from the undesirable interfacial debonding to shear failure. The minimum the ECC thickness followed by CFRP application was found optimum in enhancing both section capacity and ductility with low probability of interfacial debonding. The change in the curing ages between the ECC and the concrete beam did not show any weakness in their contact. Anwar, A.M., K. Hattori, H. Ogata and A. Goyal, 2007. Strengthening of arched hydraulic structures with CFRP. Japan cement association. Cement Sci. Concrete Technol., 61: 509-516. Aprile, A., E. Spacone and S. Limkatanyu, 2001. Role of BOND in RC beams strengthened with steel and frp plates. ASCE J. Struct. Eng., 127: 1445-1452. Kamada, T. and V.C. Li, 2000. The effects of surface preparation on the fracture behavior of ECC/concrete repair system. Cement Concrete Composites, 22: 423-431. Kanda, T., S. Tomoe, S. Nagai, M. Maruta, T. Kanakubo and K. Shimizu, 2006. Full scale processing investigation for ECC pre-cast structural element. J. Asian Architecture Build. Eng., 5: 333-340. Li, V.C., 2002. Reflections on the research and development of engineered cementitious composites (ECC). Proceedings of the JCI International Workshop on Ductile Fiber Reinforced Cementitious Composites, October 21-22, 2002, Takayama, Japan, pp: 1-21. Li, V.C., Y.M. Lim and D.J. Foremsky, 1995. Interfacial fracture toughness of concrete repair materials. Proceedings of the 2nd International Conference on Fracture Mechanics of Concrete Structures II, FRAMCOS-II, July 25-28, 1995 Zurich, Switzerland, pp: 1329-1344. Lim, Y.M. and V.C. Li, 1997. Durable repair of aged infrastructures using trapping mechanism of engineered cementitious composites. Cement Concrete Composites, 19: 373-385. Maalej, M. and K.S. Leong, 2005. Engineered cementitious composites for effective FRP-strengthening of RC beams. Composites Sci. Technol., 65: 1120-1128. Maalej, M. and K.S. Leong, 2005. Effect of beam size and FRP thickness on interfacial shear sStress concentration and failure mode of FRP-strengthened beams. Composites Sci. Technol., 65: 1148-1158. Waleed, A., M.S. Thanoon, M. Jaafar, A. Razali and K.J. Noorzaei, 2005. Repair and structural performance of initially cracked reinforced concrete slabs. Construct. Build. Mater., 19: 595-603. Zhang, J., C.K.Y. Leung and Y.N. Cheung, 2006. Flexural performance of layered ECC-concrete composite beam. Composites Sci. Technol., 66: 1501-1512.